In the core of the sun, nuclear fusion produces neutrinos—invisible, low-mass particles that rarely interact with ordinary matter. These solar neutrinos race directly through the bulk of the sun and onward to Earth at nearly the speed of light. Until recently, neutrino detectors around the world have measured far fewer neutrinos than predicted by the standard solar model. This is the ‘solar neutrino problem’. If the sun were slowly contracting, the problem might have been alleviated. In the shrinking-sun scenario, the sun produces fewer neutrinos because less fusion occurs—with energy being supplemented by gravitational collapse. If true, this model would have made an additional ‘young solar system’ argument since a gravitational collapse cannot last for billions of years. However, recent Sudbury Neutrino Observatory (SNO) data indicate that the solution to the neutrino deficit lies with neutrino physics—not solar physics. It seems that neutrinos oscillate; they are able to change into other kinds of neutrinos, which have been undetectable until now. The SNO is capable of detecting these more elusive versions and they do indeed account for the ‘missing’ neutrinos; there is no longer any deficit. These latest results are consistent with a sun that is entirely powered by nuclear fusion. 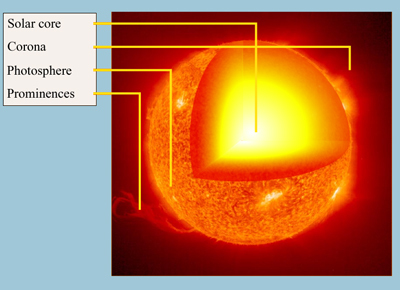 The most widely accepted source for the sun’s energy is nuclear fusion in the core. Hans Bethe proposed the theory in 1939, and the theory earned him the 1967 Nobel Prize for Physics.1 The process involves extremely fast-moving hydrogen nuclei (i.e. protons) joining to form helium.2 Fusion requires temperatures of millions of degrees, hence the term thermonuclear. Some mass is lost and converted into a huge amount of energy as per Einstein’s famous formula E = mc2 . Thus the sun would be essentially a gigantic hydrogen bomb.3 If fusion were totally responsible for the sun’s huge power output of 3.86 x 1026 watts, four million tonnes of matter would be converted every second into energy—this is huge, but negligible compared to the sun’s enormous total mass of 1.99 x 1030 kg (330,000 x Earth’s). where e+ is a positron or anti-electron, and νe is an electron-neutrino. I.e. four hydrogen atoms (mass = 1.008 AMU) convert to helium (mass 4.0039 AMU) losing 0.0281 AMU (1 atomic mass unit = 1.66 x 10–27 kg), releasing 4.2 x 10–12 joules of energy. The fact that we can detect neutrinos from the sun is direct proof, and the only direct proof that there is some fusion occurring. Gravitational collapse or chemical processes cannot be entirely responsible for all the sun’s energy since these processes do not produce neutrinos. Since ordinary matter is essentially ‘transparent’ to these particles (most would pass right through a light-years–thickness of solid lead), neutrino detection can be difficult. Ironically, it is this ghostly nature that makes neutrinos so very useful. Since they pass directly through the sun’s outer layers without interaction and on to Earth at nearly the speed of light, neutrinos allow astronomers to directly probe the solar core. The first experiment to detect solar neutrinos began in 1967 in the Homestake mine, South Dakota.25 This experiment used 400,000 litres of cleaning fluid (tetrachloroethylene—C2Cl4) to detect the neutrino-induced conversion of a few 37Cl atoms to 37Ar atoms.4 This amount of fluid is necessary to compensate for the weak interaction of neutrinos with matter. The cross-section for a typical neutrino5 is only 10–44 cm2. Thus, even with 400,000 litres of liquid, and trillions of neutrinos streaming through this fluid every second, only a few captures per week were expected (based on solar model computations). However, this experiment detected only about one third the predicted number of neutrinos. This is the ‘Solar Neutrino Problem’. The problem was not alleviated as other detectors came online; they confirmed this neutrino deficit. Either something was wrong with the standard solar model, or something was wrong with the accepted model of neutrino physics. If the standard solar model were wrong—if the actual rate of fusion in the core were only one-third the expected rate, then the sun would produce only one third the expected number of neutrinos. This result would be consistent with the earliest neutrino counts, but it required that the sun have an additional source of power. Perhaps a Kelvin–Helmholtz collapse6 would provide the remaining two thirds of the sun’s power. That is, if the sun were slowly shrinking, it could produce energy directly from its own gravitational potential energy; this energy would supplement the energy from fusion. This was only one possibility, but evolutionists had to dismiss it out of hand because of their belief in billions of years. A gravitational collapse cannot sustain the sun for billions of years whereas fusion (in principle) can. Oscillating neutrinos explain ‘missing’ ones? Because of observations at the Sudbury Neutrino Observatory, it now appears that the solution to the solar neutrino problem lies with neutrino physics. There are three types (called ‘flavours’) of neutrinos. These are electron neutrinos (νe), muon neutrinos (νµ) and tau neutrinos (ντ)—each of these is a neutral, low-mass version of a corresponding charged lepton.10 The sun produces only electron neutrinos. Moreover, the earlier radiochemical neutrino detectors (including Homestake) could detect only this flavour. The neutrino oscillation theory proposes that neutrinos can switch flavours. This is an elegant solution to the solar neutrino problem; the reason neutrino observatories detected only one third the expected number of neutrinos is because two thirds have switched into flavours that could not be detected. The theoretical and experimental basis for this proposed solution is explained in detail in the following section. Initially, this neutrino oscillation model met with much resistance;11 for oscillations to occur, neutrinos must have at least a small amount of rest mass, yet they were previously thought to be massless, and this was consistent with standard particle physics theory. Nonetheless, the latest data are consistent with this model as will be shown below. There are different kinds of neutrino detectors, which use different methods and are sensitive to different energy ranges of neutrinos. Radiochemical detectors (such as Homestake) detect only a raw count of neutrinos—without energy resolution, or information on direction. Other detectors use a water Čerenkov12 method; these can detect the precise time of the neutrino event, and estimate the energy and direction13 of the incoming neutrino. The trade-off is energy threshold—they can detect only high-energy neutrinos. A comprehensive discussion of all existing detectors and their results would be quite lengthy. This article will focus on the latest results from the Sudbury Neutrino Observatory; these data make a compelling case for Neutrino Oscillations. 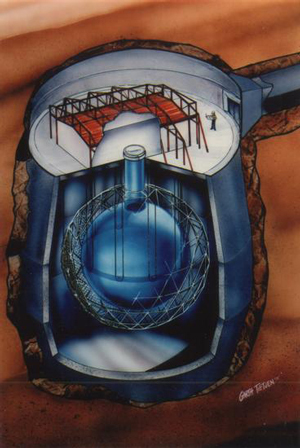 The Sudbury Neutrino Observatory (SNO) is a water Čerenkov detector located in INCO’s Creighton mine near Sudbury, Ontario, Canada.14 The SNO consists of a sphere, 12 m in diameter, filled with heavy water (D2O),15 and surrounded by light water (H2O)—to provide shielding from non-neutrino sources such as radioactivity.16 When a neutrino interacts with the heavy water, the Čerenkov photons generated within the sphere are detected by an array of 9,456 photomultiplier tubes placed around the sphere. SNO can detect neutrinos in three different ways: the charged current (CC) reaction,17 the elastic scattering (ES) reaction,18 and the neutral current (NC) reaction.19 The CC reaction can detect only electron neutrinos (νe). The ES reaction can detect all neutrino flavours, but with reduced sensitivity to νµ and ντ . The NC reaction detects all neutrino flavours with equal sensitivity. By comparing the measured rates of the three reactions, it is possible to determine if any neutrinos are of a non-electron flavour. The reactions are listed below. The d represents a deuteron.20 The p, n, and e– are a proton, neutron, and electron, respectively. The νx indicates that all flavours of neutrinos can undergo the reaction. The latest SNO results are now examined21 and compared with predictions. Using the standard solar model, Bahcall, Pinsonneault, and Basu have predicted22 a total neutrino flux (φ) for the 8B solar neutrinos23 at which can be compared with the observed values for each of the three reactions.24 In the measured values shown below, the first error bars are statistical and the second are systematic. The results are normalized for the 8B neutrino spectrum with an energy threshold of 5 MeV. All values are in units of 106 cm–2 s–1. The NC reaction (which detects all neutrino flavours equally) is consistent with the standard solar model predictions. It does not show a deficit of neutrinos, yet it exceeds the fluxes of the other reactions that detect electron neutrinos preferentially (the ES reaction has been normalized assuming only electron neutrinos), or exclusively (as with the CC reaction). This is compelling support for neutrino oscillations. It is not consistent with a ⅓ fusion and ⅔ gravitational collapse power source. If the sun were simply producing fewer neutrinos than predicted, then all three fluxes should be reduced equally—the same as the CC flux. Less fusion would mean fewer neutrinos ‘across the board’; only oscillations to other flavours can readily explain the differences in the measured fluxes. The SNO data are demonstrated visually in the accompanying figure. The flux values for the non-electron neutrinos are 5.3 standard deviations above zero (combining the uncertainties). This detection of non-electron solar neutrinos makes a very compelling case for neutrino oscillations. The latest SNO results do not show a neutrino deficit for the NC reaction. The results of the three detection methods are consistent with the standard solar model (in which the sun is powered entirely by fusion) with neutrino oscillations. Thus, creationists should not use gravitational collapse as a possible explanation for the (former) deficit of neutrinos from the Sun. While most particle physicists previously thought that neutrinos had zero rest mass, this is no longer a possibility. This has implications for cosmology, since neutrinos with finite mass may contribute to dark matter. These results remind us how easily the views of the scientific community can change as new evidence is discovered. If good, operational scientific models can be overturned by new observations, how much confidence can we really have in man’s conjectures about the unobservable past? Jonathan Sarfati Format: DVD Length: 49 minutes Audience: High School-Adult In this candid presentation before an international conference of nearly 600 creationist speakers and writers, Dr Jonathan Sarfati reveals the out-of-date, faulty and downright flaky evidences that reputable creationists must avoid. In his trademark style, Dr Sarfati challenges some of the most-loved arguments of modern creationists, while encouraging us to focus intensely on God’s written Word as the absolute guide to evidence interpretations! 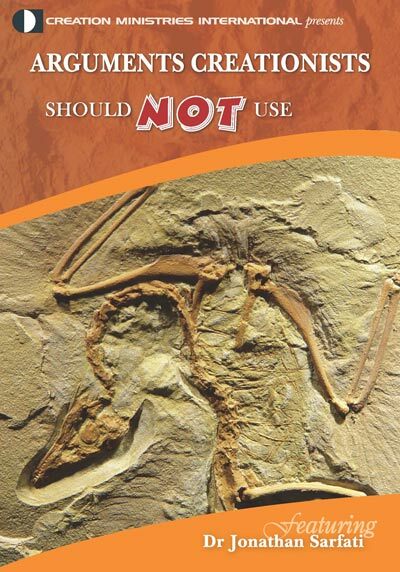 Succinct explanations and warnings regarding: Archaeopteryx—the transitional bird Darwin’s deathbed recantation The New Zealand plesiosaur Solar neutrinos The archeological claims of the late Ron Wyatt Moon dust NASA’s finding of Joshua’s long day Hezekiah’s sun dial The origination of the 2nd Law of Thermodynamics Micro-evolution Wingless beetles Discover how to avoid or overcome scientific fallacies, outdated arguments and universal statements. While the content of this popular, illustrated presentation DVD is the same as one you may have with the same title, it now includes extra features. Not only does it have a new cover design, it also has English sub-titles, has been ‘re-badged’ to feature the CMI logo and contact details and includes a 3-minute promotional segment. ‘Bethe, Hans Albrecht’, The New Encyclopædia Britannica 2:173, 15th Ed., 1992. Return to text. The sun produces neutrinos by the proton-proton (PP) chain in which four protons are fused into one helium nucleus producing neutrinos in the process. There are three paths by which this can happen (PPI, PPII, and PPIII). These all occur simultaneously in the sun. Return to text. Man-made hydrogen bombs use the heavy hydrogen isotopes deuterium and tritium, plus some lithium. The sun uses ordinary hydrogen—a reaction that requires higher temperatures. Return to text. Bahcall, J., Neutrinos from the Sun, Scientific American 221(1):28–37, 1969. Return to text. Clayton, D., Principles of Stellar Evolution and Nucleosynthesis, University of Chicago Press, 1983. Return to text. In fact, in the 1800s, this method was thought to be the sun’s sole power source. Return to text. For example, see ‘Young’ age of the Earth & Universe Q&A, <creation.com/young> Return to text. DeYoung, D.B. and Rush, D.E., Is the sun an age indicator? CRSQ 26(2):49–53, 1989. Return to text. Nor does this indicate that it the sun is ‘young’. A fusion power source is ‘neutral’ with respect to the age issue. Return to text. A lepton is a spin–½ particle (fermion) that does not experience the strong nuclear force. Return to text. 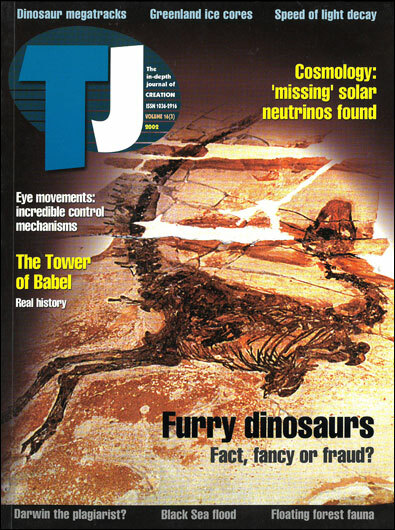 Bahcall, J. and Davis, The Evolution of Neutrino Astronomy, Millennium Essay in PASP 112:429-433, 2000. Return to text. Čerenkov (‘Cherenkoff’) radiation is light produced by a charged particle whose speed is greater than the speed of light in that medium. It’s sometimes considered analogous to a sonic boom caused by objects exceeding the speed of sound in the medium. Neutrinos (being neutral) do not produce this radiation, but they can interact with a charged particle (such as a collision with an electron) causing the charged particle to move at high speed. Return to text. The direction of the incoming neutrinos confirms that they do indeed come from the sun. Return to text. Information on the SNO is available online at www.sno.phy.queensu.ca, 3 June 2002. Return to text. Deuterium is a heavy isotope of hydrogen with approximately double the atomic mass. Return to text. The SNO Collaboration, Measurement of charged current interactions produced by 8B solar neutrinos at Sudbury Neutrino Observatory, 18 June 2001. The article is available online at www.sno.phy.queensu.ca/sno/first_results/, 3 June 2002. Return to text. So-called because the interaction is mediated by the charged W boson (a boson is a particle with integral spin). Return to text. I.e. no kinetic energy is lost. Return to text. So-called because the interaction is mediated by the neutral Z boson. Return to text. Deuteron—a deuterium nucleus. It consists of 1 proton bound to 1 neutron. Return to text. The SNO Collaboration, Direct Evidence for Neutrino Flavor Transformation from Neutral-Current Interactions in the Sudbury Neutrino Observatory, 19 April 2002. An online preprint is available at www.sno.phy.queensu.ca/sno/results_04_02/, 3 June 2002. Return to text. Bahcall, J., Pinsonneault, and Basu, Solar models: current epoch and time dependences, neutrinos, and helioseismological properties,The Astrophysical J. 555:990–1012, 2001. Return to text. PPI and PPII produce only relatively low energy neutrinos that fall below the detection threshold of water Čerenkov detectors like SNO; yet over 99% of the sun’s energy is produced by the PPI and PPII processes. Only the less common high-energy PPIII (8B) neutrinos (produced by the decay of Boron-8 into Beryllium-8) are detectable by SNO. However, the lower energy neutrinos are detectable by radiochemical neutrino detectors. Return to text. The values represent the ± error bars on the number 5.05. Return to text. This experiment was the work of Raymond Davis Jr. Davis is one of three recipients of the 2002 Nobel Prize in physics for his contributions in neutrino physics. Davis shares the award with Koshiba Matatoshi (also a pioneer in neutrino physics) and Riccardo Giacconi for his work in X-ray astronomy (update added in proof). Return to text.